The South Penn Branch originated in Chambersburg and terminated at Richmond Furnace, 26 miles distance. The branch was originally chartered as the Southern Pennsylvania Iron & Railroad Company, a corporation founded by the Ahl Brothers of Newville. The Ahl's, who had amassed wealth selling government mules, started a series of ore mines and foundries in the Cumberland Valley and eventually built a competing railroad to the CVRR. 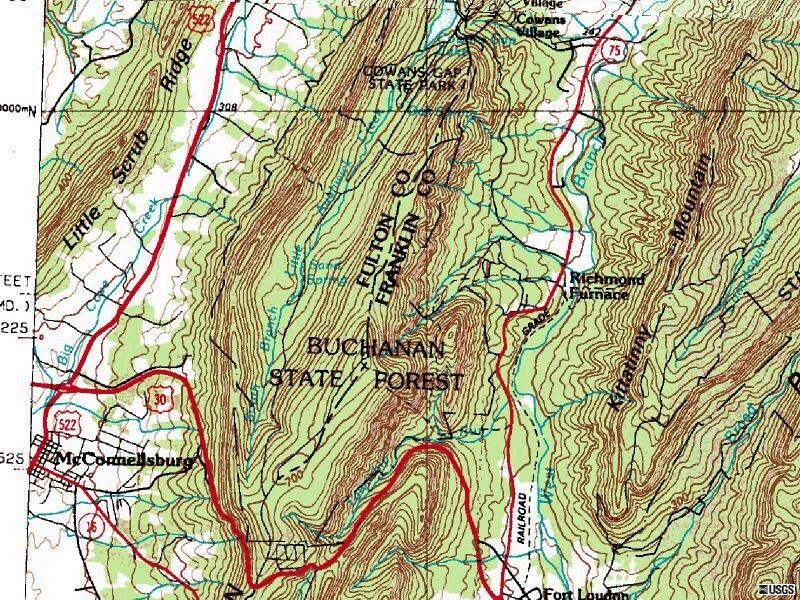 This first venture, however, involved a 5,000 acre estate around Cowan Gap. Pennsylvania was leading the nation at the time in iron production, most of it produced on self contained properties east of the Alleghenies. Iron ore was mined locally along with fluxing limestone and charcoal fuel produced from an estate's forests. The iron produced in the large pyramidal furnaces was molded into pigs for shipment elsewhere or converted into finished products right on the property. In any event, the Ahl's soon discovered other properties that interested them more and sought investors or a buyer for the Cowans Gap property, which was found in one Richmond L. Jones, a politically connected attorney from Reading. The Ahl's pressed Jones to disclose the names of his silent partners and they turned out to be none other than the CVRR and Thomas Scott of the PRR (Scott, by the way, was a local from this area). The deal was done and after legal wrangling, the Ahl's were booted from the company. About this time iron producing estates were giving way to larger steel mills centered around Pittsburgh and the Richmond Furnace was doomed for failure. 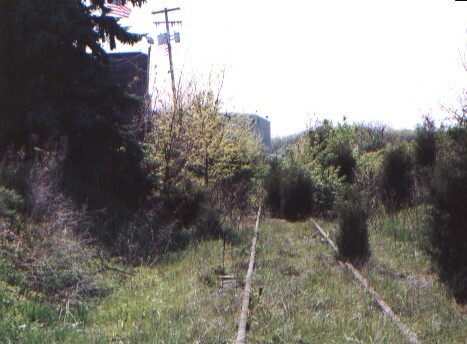 The Southern Pennsylvania Iron & Railroad Company was foreclosed by the CVRR in 1872, thus setting a pattern for the CVRR to obtain future branch lines. It is often thought that the CVRR and PRR had planned for the eventual takeover all along. At the time of the founding of the CVRR in 1836, a plan existed for its extension to Pittsburgh by winding through the ridges, starting at Cowans Gap. The route was deemed less desirable than the Juniata River route which the PRR eventually followed. The PRR in 1872 wanted to make sure that no other competing railroad laid claim to a southern Pennsylvania route by blocking the use of Cowans Gap. 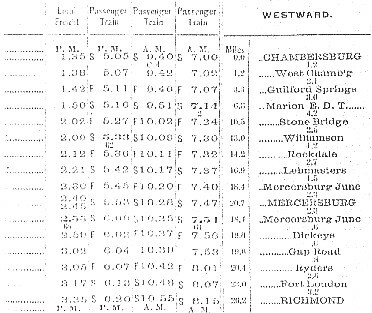 To add to the confusing situation at the time, Vanderbilt of NY Central started building a southern Pennsylvania route by chartering the South Pennsylvania Railroad that would connect with the Reading at Harrisburg and then go cross country to Pittsburgh on a tunnel-studded route. Vanderbilt was backed by Carnegie and other steel industrialist who felt they were being overcharged. When completed, three trunklines would compete for Pittsburgh's business, a situation sure to cause some if not all to fail. After considerable grading and tunneling was underway, J.P. Morgan persuaded Vanderbilt to abandon the South Penn project . In 1894 the PRR had the CVRR purchase the right of way from Harrisburg to Everett PA. The CVRR sold the right of way to the state in 1938 and the route became the Pennsylvania Turnpike, considered to be the nation's first super highway. 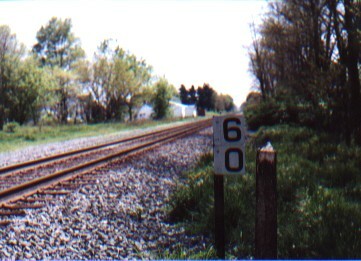 This 60 mile marker is just south of South Penn Junction at Kaufman. 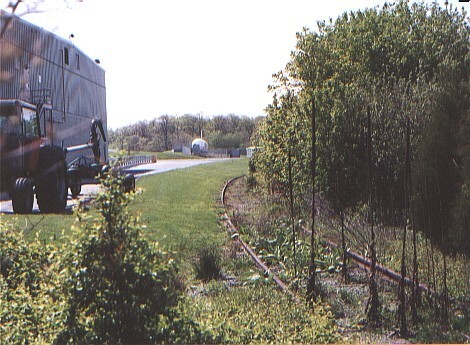 A grain elevator is close to the tracks, but no siding currently exists. What is puzzling is that the modern mile marker is the same spot as the original cast iron CVRR mile marker. Is the mileage the same using the Reading route as the original CVRR route through Newville, or is their a skip in the mileage at Shippensburg where the Reading route is used by NS instead of the old abandoned CVRR route? Here at Gibble's Potato Chip facility, CVRR South Penn Branch rails are still in place ! The rails have been pulled up at the U.S. Rt. 11 crossing and it appears that no traffic has used the rails for an extended period of time. At the next place I could find the grade a mile or so west, no rails are in place. After the failure of the Richmond Furnace, the South Penn Branch existed off of passenger traffic, a tannery at Mercersburg and a lime quarry at Williamson, and the ever present grain elevators. Westhaefer's book does not state when the branch was abandoned since it occurred after 1919, the end of his history of the independent CVRR. A photo of the rails being removed at Richmond Fund in the CVRR station at Ft. Loudon is captioned 1959, so that possibly marks the end of the branch. 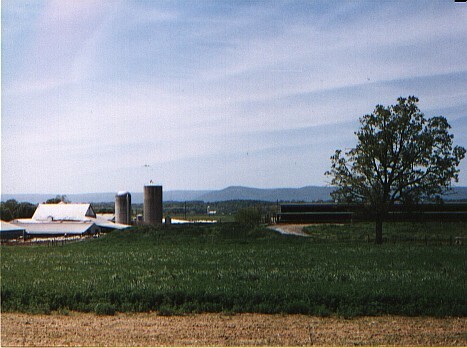 The route the South Penn followed, from Cumberland Valley to Kittattiny Mountain in the distance. It is hard to believe that Kalbach Lumber Co.'s Shay was related to WM Shay #6, but Kalbach's model is probably more what Emphraim Shay had in mind. 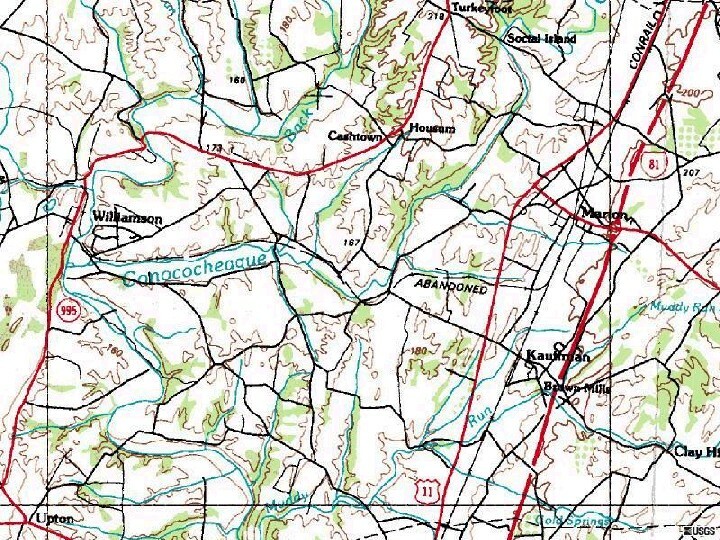 Kalbach's 36" guage logging railroad crossed through Cowens Gap into Fulton County, partially fulfilling the CVRR dream for their road to use various gaps in the Tuscarora Mountains to find a way to the Raystown Branch at Everett Pennsylvania from whence a route could climb over Allegheny Mountain to Pittsburgh and beyond. Shop Number 791 - Built for: H. Kalbach Lumber Co.
Gear Ratio: 2.5 Wheel Diam: 22" Gauge: 36" Boiler: [Style - Diam.] Boot - 30"